Hervey Wistar Hinshaw1,2,3,4 [Harvey Hinshaw5]. He married Mary Fay Raines, Jan 5 1922, Vigo County, Indiana.1,2,4 Mary, daughter of Jesse Raines & Alice Hinshaw, was born Jan 1 1901, Sheridan, Hamilton County, Indiana.2,4,5 Mary was from the Lamong community in Hamilton County, Indiana.1 Hervey and Mary were 6th cousins. WESTFIELD -- Hervey W. Hinshaw, 77, R.1, Westfield, died early Sunday morning at his home after an illness of three months. Born in Hamilton County, he was a son of Francis and Emma Harvey Hinshaw. He had lived for 18 years in North Carolina coming back to Hamilton County 19 years ago. Mr. Hinshaw was an army veteran of World War I: a member of the American Legion, the Lamong Friends Church and the Westfield Masonic Lodge. 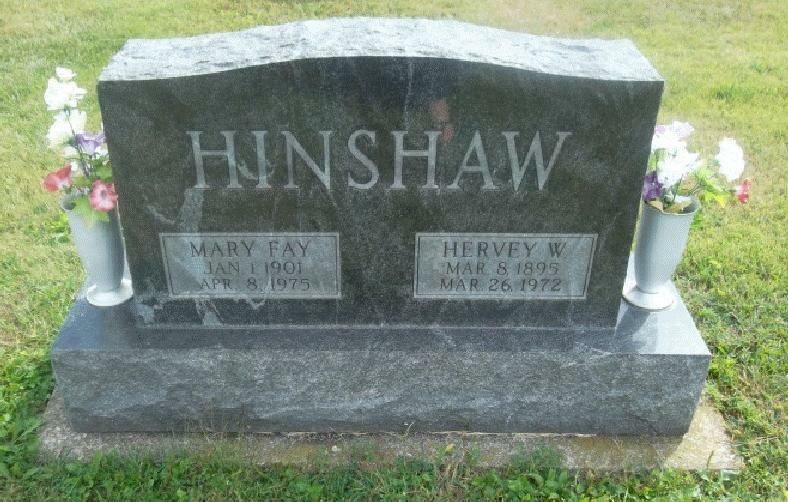 He is survived by his wife, Mary Raines Hinshaw. Mary Fay Hinshaw, 74, R.1, Westfield, died Tuesday afternoon at Riverview Hospital after an illness of one year. A native of Hamilton County, she was born, Jan. 1, 1901 to Jesse and Allie (Hinshaw) Raines. She was married in 1922 to Hervey Hinshaw who died in 1972. Two sisters, Mrs. Olive Nay and Miss Dee Reines [sic], both of Sheridan, survive along with nieces and nephews. She was a member of the Lamong Friends Church.